Select "View Payments" at the bottom on your invoice and click "edit" on the payment you want to delete. Note: Deleting a Stripe payment will ask if you want to refund the buyer. 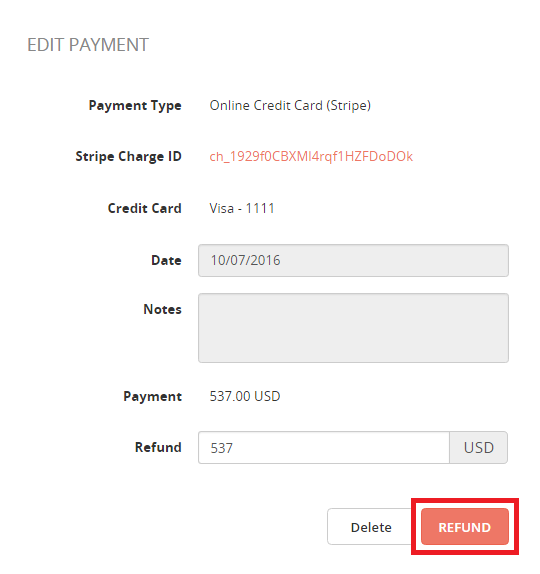 Only transactions made through Stripe can be refunded through Brandboom. To learn more about managing payments in Stripe, see this article. 1) Click "View Payments", at the bottom on your invoice. Click "edit" on the payment you want to refund. 2) Verify or change the amount you want to refund and select the "Refund" button. 3) The payment amount listed should reflect the refund. If you refunded the full amount, the payment will change to 0.00.